Why does a girl “throw like a girl”? In fights, why do men swing their limbs, while women grab and scratch? Why do men focus on a woman’s physical appearance, while women focus on a man’s personality and behavior? Why do women have breasts? Why do women like clothes so much? I have a simple, consistent explanation for every observed difference between men and women. In this article I will focus on the male and female brain. To understand this article, you should first read my article on Thought. Men and women think very differently, yet our brains appear identical. Many scientists have sought to find the big difference between the male and female brain. One of the only differences they’ve found is that a man’s brain is typically 10% larger than a woman’s brain. This difference is negligible, however, after accounting for the fact that a man’s body is about 10% bigger than a woman’s body. Scientists have also found that certain regions of the male brain to be a few percent bigger, or certain regions of the female brain to be a few percent bigger, but nothing truly statistically significant… until Haier in 2005. His study found that “men had roughly 6.5 times the number of grey matter [3D pixels] identified as related to intellectual functioning as did women, and women had roughly 9 times more white matter [3D pixels] than did men.” This is worded strangely, but I interpret it as meaning: when performing the same IQ test, on average, men use grey matter 6.5 times more than women; furthermore, women use white matter 9 times more than men. These numbers are hugely statistically significant. To clear up any confusion, the actual mass of grey matter and white matter are roughly the same between men and women (after adjusting for the 10% body size difference); if men had 6.5 times more grey matter than women it would be obvious by just looking at the brain with the naked eye. Thus, I believe the gender difference lies in how the brain is used. Gold denotes use and grey denotes disuse. 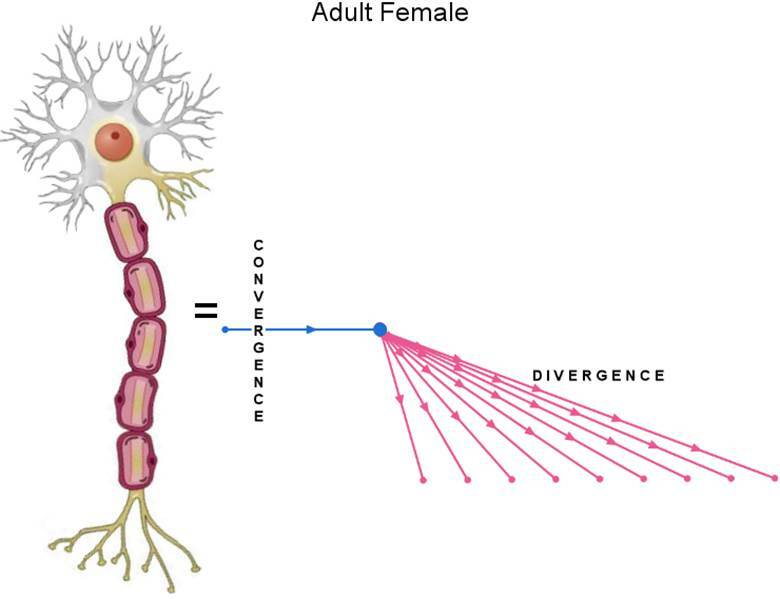 Notice how the male neuron uses 6.5 times more dendrites than the female neuron. Notice how the female neuron uses 9 times more axon terminals than the male neuron. 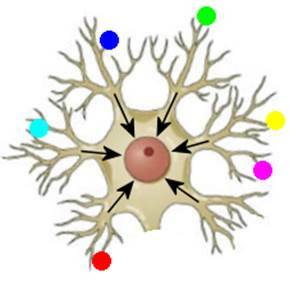 Note that this is a visualization of the typical, or average, neuron of the cerebrum—the number of dendrites and axon terminals varies from neuron to neuron. “6.5” and “9” describe how the neuron was used during the IQ test administered by Haier, but I am extrapolating these findings to everyday thoughts. You may recognize the picture above because I used it in Thought to describe convergence and divergence. These are terms I made up to explain my hypothesis. 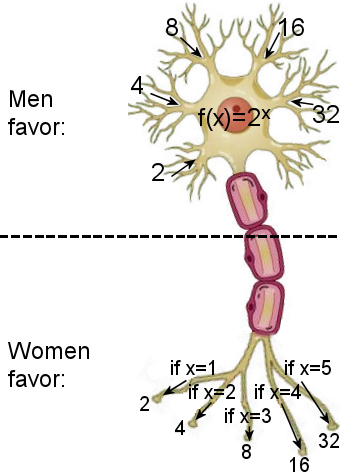 I hypothesize that there is only one difference between the male and female mind: at the neuronal level, males prefer to use the dendrites, soma, and nucleus (i.e. grey matter); whereas females prefer to use the axon and axon terminals (i.e. white matter). Or, in my own terms: males favor convergence and its products, whereas females favor divergence and its products. This hypothesis applies to the typical male and the typical female. Obviously, there will be outliers: men who think like women, women who think like men, androgynous men, and androgynous women. The dendrites take in the numbers 2, 4, 8, 16, and 32. All numbers must be considered simultaneously in order to figure out the commonality among them, f(x) = 2x. This is convergence. Divergence is taking the formula and plugging in specific values for x, one at a time, and producing different numbers (at different axon terminals): 2, 4, 8, 16, and 32. In actuality, the numbers 2, 4, 8, 16, and 32 represent signals that are transmitted. x=1, 2, 3, 4, and 5 represent five distinct neurons attached to five distinct axon terminals. The words “theory” and “application” may come to mind when you look at this example. Yes, among other things, convergence is theory and divergence is application. The nodes are pieces of information, and the arrows show the direction that information is going. Notice how the products of divergence (i.e. specific pieces of information) are spread out horizontally, which means they occur over time. The inputs of convergence are lined up vertically, which means they occur simultaneously. This is just like melody and harmony in music, respectively. 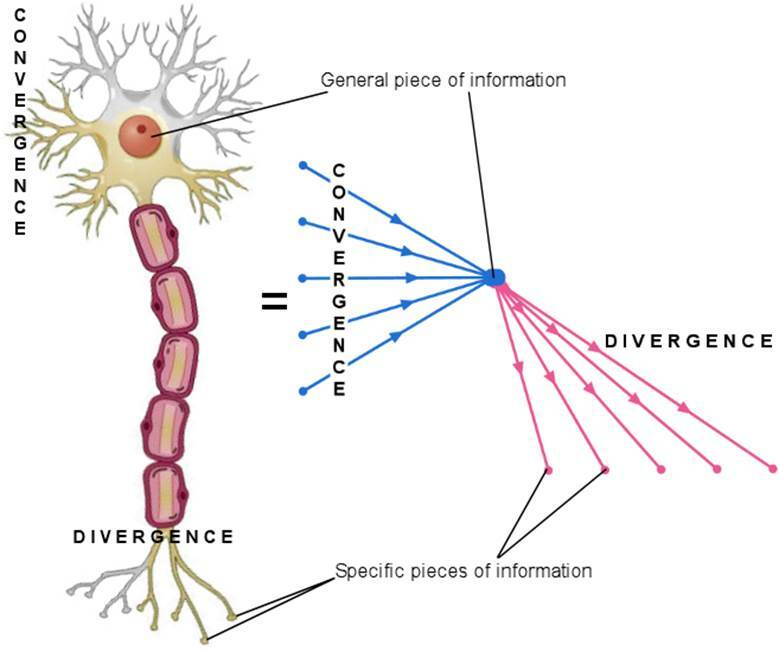 In the picture above, notice how the neuron and its equivalent have five pieces of information coming together and five splitting apart. This is how a child thinks. I believe most children use convergence and divergence just about evenly. This means that for every time information is put together, another piece of information is separated. Whether the child is male or female is hardly relevant because the mind is hardly sexually dimorphic at this age. As a boy becomes a man, though, he will increasingly favors convergence and increasingly disfavors divergence, just like a balance scale tipping to one side. This is mainly attributed to a rise in testosterone level and a drop in estrogen level. This shows my hypothesis of how the typical adult male uses neurons in the cerebrum. 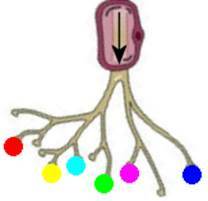 Notice the imbalance: many dendrites are used while only one axon terminal is used. Convergence (shown in blue) is favored. Thus, the adult male pays attention to information that is presented simultaneously, as represented by the nodes lined up vertically, and general information, as represented by the center node. Divergence (shown in pink) is disfavored. The adult male barely pays attention to specific information. The adult female develops the ability to use large amounts of information in the process of divergence. The adult female pays attention to specific information that is presented sequentially (i.e. over time), as represented by the pink nodes lined up horizontally. The adult female barely pays attention to general information, as represented in blue. 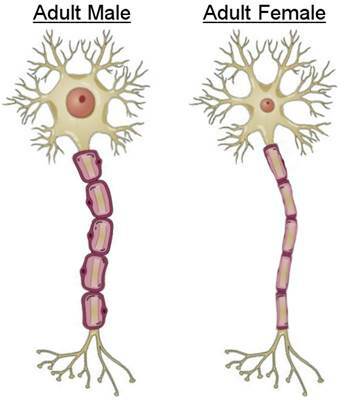 It looks as if the adult male neuron is simply more massive than the adult female neuron, but it’s not that simple. Low testosterone produces a small soma and high testosterone produces a large soma. Or, in my own terms, weak convergence produces a small soma and strong convergence produces a large soma. Or, in other words, the soma enlarges as more information is taken in (simultaneously) by the dendrites. 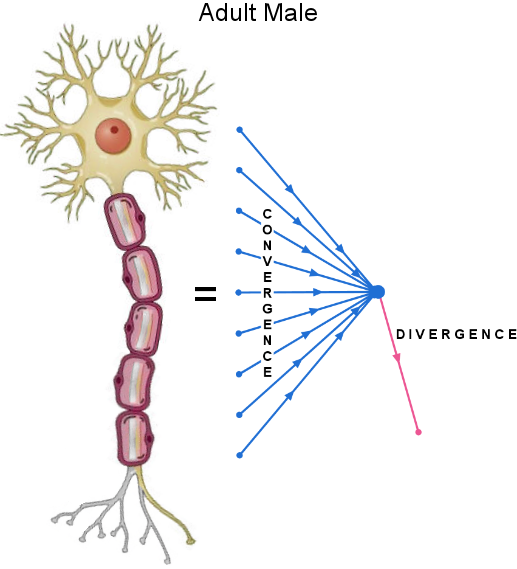 For the lower half of the neuron, size decreases with strength. 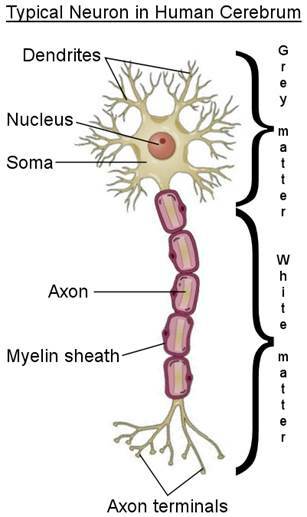 So as more information is (serially) transmitted across the axon, the myelin sheath becomes thinner. 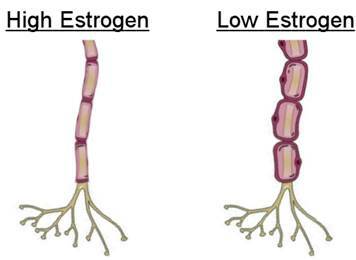 Low estrogen results in thick myelin sheath and high estrogen results in thin myelin sheath. Or, in my own terms, weak divergence results in thick myelin sheath and strong divergence results in thin myelin sheath. As my hypothesis goes, males favor simultaneous processing. And with a high level of testosterone in the brain, the dendrites would be capable of processing large amounts of simultaneous information. This would be objects with complex shapes, and more objects moving around. So why are verbal tasks female-dominant? Try to take in a paragraph of words simultaneously. You get a jumbled mess. Try to speak multiple thoughts simultaneously. You speak a jumbled mess. Reading and speaking are inherently sequential, and thus cater to sequential processing. “A picture is worth a thousand words” is a simple, accurate summary for the simultaneous nature of visual information and the sequential nature of verbal. Due to the simultaneous nature of convergence, to go from weak to strong convergence is a change in intensity; due to the sequential nature of divergence, to go from weak to strong divergence is a change in frequency. This is a key distinction between (male-favored) convergence and (female-favored) divergence. Let’s go back to the math example. Say you’re given 3 numbers and told to figure out the pattern among them (i.e. a commonality). This is likely easy to figure out. Say you’re given 30 numbers and told to figure out the commonality. This is more difficult because there are more numbers to consider simultaneously. The convergence is more “intense”. Say you’ve figured out the equation that represents all the numbers and now you want to plug in values for x to get the numbers—divergence. Plugging in 3 numbers is easy. Plugging in 30 numbers is more difficult and time-consuming because it requires greater “repetitions” (i.e. frequency)—sequential processing. Plugging in 30 numbers one at a time cannot be greater intensity. Intensity versus frequency is a key difference between convergence and divergence. In summary, the fundamental difference between men and women is convergence versus divergence. In the brain, this means using the dendrites/soma/nucleus versus axon terminals/axons. This difference is the foundation for all personality and behavior differences between male and female, which is covered in Part 3. Part 2 shows how convergence and divergence are expressed in the face and body. It is no coincidence that chest muscle usage can range from low to high intensity, yet the same cannot be said about fingertip usage, which can only range from low to high frequency. The causality in sexual dimorphism is not cut-and-dry. Genetics aren’t the cause of everything. You don’t simply have genetically-predisposed hormone levels to determine how masculine or feminine you grow up to be. That is, your axon terminal usage, or the size of your myelin sheath, is not simply guided by your estrogen level. You can train your neurons to be more effeminate by thinking “divergent” thoughts. Likewise, your dendrite usage, or the size of your soma, is not simply guided by your testosterone level. You can train your neurons to be more “masculine” by thinking “convergent” thoughts. This is no different than doing pushups every day to develop a more masculine body.